Encountering the work of Anthony Ritchie was one of my musical highlights of 2012 (review). So much so that the CD of his Third Symphony (and other works) was one of my discs of the year. That being the case I was delighted to have the opportunity to hear the two symphonies that preceded it and all the more delighted to be able to report that all good impressions created by the first disc are reinforced here. Some biographical detail is useful; Ritchie is a New Zealand composer, currently senior lecturer in composition at Otago University. The skill which Ritchie exhibits on both of these discs is to write music clearly ‘of its time’ which is both serious in intent yet accessible and intelligible. He strikes me as part of a small elite group of composers who have found - in their differing ways - a personal musical language that takes elements of contemporary musical culture, whether nominally classical, ethnic or popular and fuses the resulting conflation into works that speak with a relevance and depth to audiences who might otherwise feel the contemporary music genre was too unapproachable. As soon as one increases one’s knowledge of a composer’s works the process of compare and contrast can begin. With the Symphonies one element is immediately clear; they all have extra-musical associations. This is not to say they are programmatic works, rather that the music springs from a starting point of inspiration sign-posted by the title. The titles in themselves are slightly elusive and need explanation but that knowledge does not dictate the interest in the music in absolute terms. The title of the First Symphony “Boum” is explained in the composer’s liner-note thus; “the title of this symphony comes from the ominous tam tam stroke that opens the first movement, a mysterious echo heard by two characters from E.M. Forster’s A Passage to India when they enter the Marabar Caves. This echo comes to symbolise the mysteries of life and death in the novel…”. The symphony’s opening is wonderfully atmospheric regardless of programme. After the aforementioned quiet tam tam the strings set up a Sibelian throbbing texture countered by tentative woodwind phrases. Once the lower strings set a regular rhythm, the horns carry the throbbing rhythm and a Ritchie characteristic quickly comes to the fore. As the momentum of the music builds Ritchie throws rhythmic cells across the orchestra. This has the effect of freeing the music from a sense of obvious meter whilst at the same time giving it an appealing pulsating groove. The composer admits to “a minimalist influence” but the harmonic flux is far higher giving the listener the best of both worlds. At key moments in the movement’s architecture the tam tam returns to mark sections and changes of mood. Another feature of the 3rd Symphony was the juxtaposition of stasis and action and clearly that was a concept Ritchie was fascinated by in the earlier work too. The second movement is an Allegro energico scherzo which features a significant part for a Cook Islands log drum. 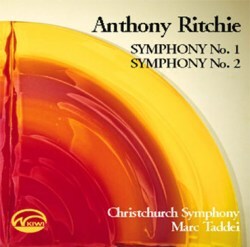 Ritchie characterises the music as “a folksy dance” where, once again, rhythms are tossed around the orchestra although symphonic unity is reinforced by the use of a slow string melody from the first movement used here as a slow-moving descant contrasting the energy of the rhythmic writing. The relative lightness and good humour of this Scherzo sets in stark contrast the chilled landscape of the slow movement - an Adagio subtitled “for the innocent of Bosnia”. The music was inspired by a Maori Karanga. This is part of a traditional greeting ceremony in which tributes are paid to the recent dead. Ritchie fuses this with tolling bells and a deceptively simple but naggingly memorable rocking melody on saxophone. When this melody passes to the strings there is a passing moment that seems to pay homage to Arvo Pärt’s Cantus In Memoriam Benjamin Britten. Although lasting barely six minutes this is a beautifully judged movement with the sincerity of its emotion reinforced by its essential simplicity. The energy of the dance-like scherzo is revisited in the finale. Again unity is provided by the ‘memento mori’ tam tam and melodically by the return of the string figure. The composer acknowledges the influence of rock and folk music elements but in no way should that be construed as dumbing-down. After one final climactic crash the music unravels itself and winds down to a reiteration of the opening string throbbing motif and the work closes with the same soft gong stroke with which it opened. The Second Symphony, written some six years later, is another work rich with literary allusion and musical metaphor. The sub-title this time is “The Widening Gyre”. This is a quotation from W.B .Yeats’ 1921 poem ‘The Second Coming’; “turning and turning in the widening gyre, the falcon cannot hear the falconer, things fall apart; the centre cannot hold; mere anarchy is loosed on the world.” Ritchie’s liner-note explains the musical riches packed into the event filled movements. Further to the overall title each movement has its own further title. The opening is “Stratagem of trumpets” - again this has a poetic derivation. This time from a poem by fellow New Zealander Peggy Dunstan of that title. The poem deals with a massacre of Serbians by Turks in 1389 which juxtaposed with the contemporary - at the time of the work’s composition - massacre of Albanians by Serbs underscores for the composer the relentless cycle of death and destruction as peoples seek power and control of land. The remarkable thing is that Ritchie finds musical constructs for these very detailed and demanding extra-musical ideas without the resulting piece suffering from an overly subjective/literal approach or simply collapsing under the weight of its “meaning”. Structural unity is again given by the use of a framing device to represent the gyre; a murky sinister percussion texture of timpani glissandi, bass drum and tam tam. The motif that follows Ritchie characterises as a “life and death theme that begins like a cradle song (the birth of Christ)..” As the movement develops it is interrupted several times by a series of paired anvil blows which Ritchie references as the death of Christ (track 4 2:24). I think it important to stress again here that I perceive such signposts as points of inspirational departure for the composer rather than a musical map for the listener. Certainly, listening initially without making reference to the liner, I had no sense of the profusion of external stimuli, instead it works - for me - most effectively as absolute music albeit of a clearly dramatic and personal nature. I like a lot the lowering gloom of the open out of which emerges a furtive wind and string pizzicato figure - in this instance I do not feel the need for extra-musical context. From this scurrying music builds an impressively sustained fugato passage with the now-familiar Ritchie hallmarks of cross-cutting rhythms and long-limbed arching melodies. The log-drum is prominent too with militaristic jagged fanfare figures giving the music a sense of aggression and violence before the anvil brings the section to an abrupt close. Solo strings lament although a solo flute seems to offer some passing balm before the movement sinks back into the quietly disturbing gyre from which it sprang. The central movement is another driving scherzo puningly titled ‘Mi-1st’. This refers to both the key centre of E (Mi in the sol-fa system) as well as being self-centred. Again it will be up to individual listeners how important these external ideas are. Personally I enjoy the driving energy and skilful orchestration where chromatic motifs swirl and entangle themselves around the gravitational centre that the repeating E’s provide. There is a nervous jittery energy in the mobile bass lines that recalls Bernstein at his most alienated. No resolution is found and ultimately the music collapses back to the gyre once more. The final movement - “Double Helix” - starts quietly too but with material that initially at least seems more assertive and positive. The title refers to the DNA that forms the genetic fingerprint of us all. Ritchie sees this as both hope for the future but also a warning that who and what we are significantly shapes and limits what we can become. It’s a ‘big’ philosophical idea for a piece of music and again I’m not sure that knowing that is what the music ‘means’ helps or enlightens that much. The helix is represented in the music as a tightly constructed canon with one line twisting and turning closely followed by another. Whatever the associations, as a piece of technical composition it shows that Ritchie is wholly able to write movements full of convincing and effective counterpoint and again this plays to his strengths of sustained musical argument built of skillfully handled orchestration. The symphony closes with helix motifs fusing with the main theme of the opening movement bringing the work to an assertively positive close. I have avoided deliberately until this moment mentioning the playing or the recording. The orchestra is the Christchurch Symphony. There is a close link with this orchestra for the composer since his father John Ritchie founded the original ensemble in the late 1950’s as the Ritchie String Orchestra. Over the years this has expanded to the point that it consists of 39 contracted players with another eighty part-time professionals to call upon. Direct comparison to the New Zealand Symphony Orchestra who play the Symphony No.3 shows the Christchurch orchestra to be competent but not first rank. Ritchie’s writing is demanding both rhythmically and technically and too often I found myself imagining passages being performed with greater ‘snap’ and technical élan. The opening of the final movement of the 2nd Symphony finds the strings challenged by Ritchie’s wide ranging melody. Likewise the close of the work could sound more cathartically positive - you can imagine the brass section of a major international orchestra whipping up a storm. Generally, and crucially, climactic moments do not expand as the music seems to demand - there is not the weight of tone from any section of the orchestra to make the music as impressive as it surely is. Whether this is a function of the engineering or the playing I am not sure - certainly the disc sounds well, with the detail and multi-coloured strands of the orchestration registering clearly. Likewise, the acoustic is generous and warm so I suspect it is down to the playing itself. It is important to be clear that this is in no way poor, clearly conductor Marc Taddei has a clear and firm grip on the music, but ultimately this is dramatic and exciting music that would benefit from a greater sense of being unleashed. What is not in any doubt is just how engaging and of real worth Ritchie’s music is. Certainly it deserves to be far more widely known than it currently is outside of his native country. By now it should be clear that this is music that appeals to both the head and the heart and speaks using a voice that will touch those who do not normally respond to the traditional Classical Music idiom. At a push I would recommend that new listeners investigate the other disc first simply because it contains music of a greater range of styles and is better performed. However, for those who have enjoyed that one already this CD provides the next logical step on an exciting voyage of discovery.